Cut asparagus into 1-inch pieces and place in vegetable steamer. Place steamer into a large saucepan and lightly steam for 2 to 3 minutes. Set aside to cool. 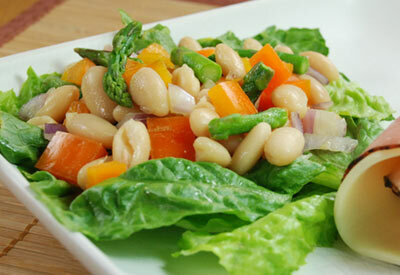 In large bowl, combine the beans, orange pepper, and red onion. Gently toss in the asparagus. In a separate bowl, whisk together the olive oil, lemon juice, mustard, salt, and pepper. Gently pour onto vegetable mixture. Taste and adjust seasonings. Line a salad bowl with leafy greens and add mixture.